Vionic Men's Tide Toe Post Sandal a very comfortable and stylish men footwear that features leather trim and an updated tread pattern. 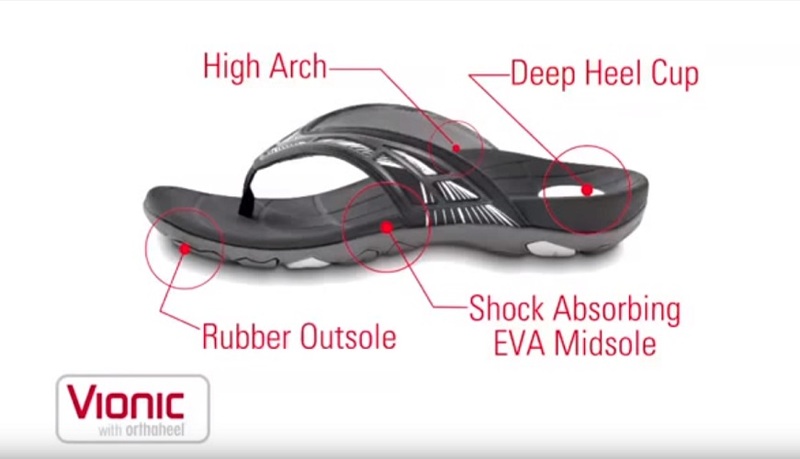 Its Podiatrist-designed and Orthaheel® Technology seamlessly incorporates enhanced arch support, unmatched comfort and classic flip flop style into one innovative sandal. Allows you to stand on your feet for hours with little distress on the lower limbs. biomechanical Tri-planar Motion Control footbed with a deep heel cup and Podiatrist-designed helps stabilize, support and realign the feet back to their natural position. Shock absorbsing, reducing stress on feet, ankles and knees, lightweight flexible and medium-density EVA midsole Durable TPR outsole with patterned tread as it helps improve traction. We recommend ordering the nearest size down for half sizes. We recommend wearing your new Vionic footwear for just a few hours for the first few days to allow your feet to adjust to the new level of orthotic comfort and support for the greatest comfort. You should find the product completely comfortable and supportive within 1 to 2 weeks. Air dry under indirect sunlight only. Do not expose to extreme temperatures. Do not use solvents and submerge on water to clean products. Home wash/dry laundry or commercial dry cleaning machines are not recommended.